Mrs Obama told ABC's Good Morning America she felt "lost and alone" after her miscarriage 20 years ago. She also criticised Donald Trump for "putting my family's safety at risk". Mrs Obama, a former lawyer and hospital administrator, told ABC that after her miscarriage, "I felt like I failed because I didn't know how common miscarriages were because we don't talk about them. "We sit in our own pain, thinking that somehow we're broken," she said, adding that "it's important to talk to young mothers about the fact that miscarriages happen". She said that when she was around 34 years old, she realized that "the biological clock is real" and that "egg production is limited", which made her decide to seek in-vitro fertilisation. "I think it's the worst thing that we do to each other as women, not share the truth about our bodies and how they work," Mrs Obama told ABC's Robin Roberts on Good Morning America. 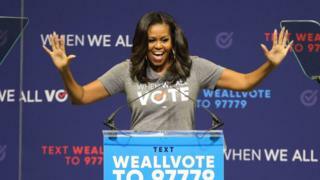 Mrs Obama revealed that the couple's relationship struggled at times, especially after her husband joined the state legislature, leaving her at home where she was forced to administer IVF shots herself. "Marriage counselling for us was one of those ways where we learned how to talk out our differences," she told ABC. "I know too many young couples who struggle and think that somehow there's something wrong with them. And I want them to know that Michelle and Barack Obama, who have a phenomenal marriage and who love each other, we work on our marriage. "And we get help with our marriage when we need it." "As soon as I allowed myself to feel anything for Barack," she writes, "the feelings came rushing - a toppling blast of lust, gratitude, fulfilment, wonder." In Becoming, Mrs Obama says she would "never forgive" President Trump for championing the "birther" theory that her husband was not born in the US, according to excerpts obtained by US media. "The whole [birther] thing was crazy and mean-spirited, of course, its underlying bigotry and xenophobia hardly concealed," she wrote. "What if someone with an unstable mind loaded a gun and drove to Washington? What if that person went looking for our girls? Donald Trump, with his loud and reckless innuendos, was putting my family's safety at risk. And for this I'd never forgive him." She said she reacted in shock to Mr Trump's presidential victory and "tried to block it all out". Before departing the White House for Paris on Friday, Mr Trump addressed some of the quotes from Mrs Obama's book. "Michelle Obama got paid a lot of money to write a book and they always insist you come up with controversy. I'll give you some back. "I'll never forgive him for what he did to our United States military by not funding it properly," Mr Trump said, referring to his predecessor, Mr Obama. "What he did to our military made this country very unsafe," he continued.